improving the quality of vision. Keratoconus is a degenerative disorder that affects the cornea. The shape of the cornea becomes more conical and irregular due to structural changes in the internal tissue, or, to be more precise, in the corneal collagen. The main anatomical signs of keratoconus are a thinning of the cornea in an area in the central or adjacent areas almost always accompanied by the same area becoming raised causing high levels of irregular astigmatism, which leads to distorted vision. Irregular astigmatism cannot be corrected using the traditional methods (glasses and soft contact lenses); instead, it is necessary to wear hard contact lenses (which often cause discomfort) in order to achieve a good level of vision. In the advanced stages of keratoconus the quality of vision becomes extremely poor and the thinning of the corneal wall reaches such a state that lesions may occur making it necessary to carry out a corneal transplant in order to save the eye. Ordinarily, in the public health system, keratoconus is not treated. Instead it is allowed to develop in the hopes that the condition will stabilise and cease to progress further. 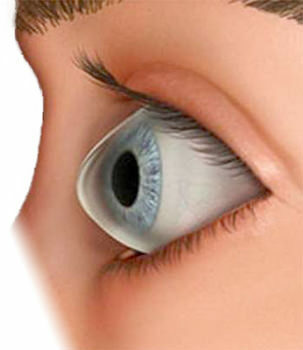 If this does not happen, a corneal transplant is carried out to replace the affected cornea. Advances in ophthalmology now offer two available treatments that arrest the progress of the condition and in some cases actually reduce the astigmatism and improve the quality of vision. This is a process in which new links, or bonds, are generated between the existing strands of corneal collagen, reinforcing and bonding together the tissue in order to increase its resistance to the advance of keratoconus. Riboflavin is activated using ultraviolet light, which stimulates the regeneration of the patient’s corneal collagen. To achieve this, the corneal tissue is saturated with riboflavin and then the cornea is exposed to a special light source in the ultraviolet range for 30 minutes. This stimulates the creation of new bonds between the long strands of collagen strengthening the corneal tissue. The new transepithelial technique provides a significant improvement in terms of the comfort of the patient and reduces still further the already limited risks associated with this treatment. Transepithelial riboflavin is able to move through the corneal epithelium. So, with this technique it is not necessary to remove the epithelium and as a result, the risks associated with this part of the procedure are eliminated. It also means that the treatment is not at all painful and will not require a long recuperation period or time off work. 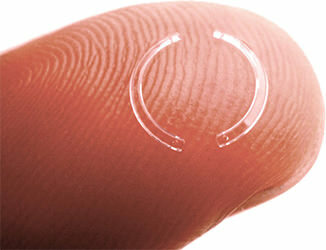 Intracorneal rings are made of methacrylate and shaped like two semi-circles. Their thickness varies according to the needs of the patient. The surgeon places them inside the cornea (the outer structure of the eye) near to the periphery to avoid the central visual field. Once they have been implanted, the intracorneal rings change the shape of the cornea (in the same way as laser surgery) by flattening the centre of the cornea, correcting up to four diopters of myopia or six diopters of astigmatism and making the cornea more regular. Often, they also slow down the advance of keratoconus. The implants cannot move around and because they are transparent, like the corneal tissue that surrounds them, they are invisible to the naked eye. The quality of the treatment depends on the method used to make the tunnel where the rings are placed in the cornea. At Vista Laser Ophthalmology we use a femtosecond laser to carry this out because it is well recognized as the safest and most precise method. The intervention takes 30 minutes and the patient will not need to stay at the clinic overnight. A local anesthetic delivered with eye drops is used and the patient can go back to their normal routine the following day. In most cases the progress of keratoconus is arrested and the patient’s vision is improved. Does keratoconus is always degenerative or you may keep it in a mild level? Keratoconus is a variable and unpredictable disease. Many patients have mild cases that do not progress significantly in one or both eyes, however there is no way to predict its development and ensure stabilization. If I have keratoconus in one eye is likely to develop in the other eye? For a large number of experts keratoconus disease is bilateral, i.e., which occurs in both eyes and therefore if a patient has a keratoconic eye is likely to develop later in the other. Keratoconus patients may progressively lose vision due to corneal distortion. The cornea is deformed and having an irregular surface does not allow us see clearly, which is called irregular astigmatism. Other reason is that they can lose vision due to inflammation and scarring of the cornea, resulting in a blurred or cloudy vision.